Understanding what employers are looking for is one of the most important aspects of job hunting. Job advertisements are a key indicator of what is most valued. In this article we’re going to examine a typical job advertisement and identify some key points. We have selected a recent job advertisement that may provide a suitable opportunity for a newcomer to the field of development and that is now expired. The interpretation is our own conjecture based on experience applying and hiring within development, and has not been authorized in any way by Oxfam UK. While every job description will be laid out differently, this is a fairly typical example. Pay attention to the fact that this is a branch of an NGO: Oxfam GB. This may mean there are restrictions on who can apply. The location is stated to be Dakar, but if the job involves a large amount of travel, you may spend long periods outside of the capital. Looking at remuneration, the range in base salary provides some bargaining room: if you scrape by on the requirements, you will be looking at the lower end of the range and vice-versa. The “Hard to Work Allowance” is provided each year as a compensation for the difficulties associated with the job. Working under the direct guidance of the Country Director, you’ll support the Chad programme to manage existing donor contracts and help secure new funding. The ability to write/edit donor proposals and reports is essential. You’ll ensure that donor reports are submitted on time and that reports meet donor regulations, as well as maintaining accurate files (with particular reference to asset management and audit trails) that are in compliance with donor requirements. You’ll have good organisational awareness, understanding how to get a range of information and who to keep informed. This is the meat of the job advertisement: what the job actually involves, which in this case is fundraising. This job description details who the position reports to, and also, unusually, begins stating some requirements of the position. This information is normally (and should be) kept separate from the job description, which should be purely about the role, responsibilities, and activities associated with the position. “Ability to write/edit donor proposals” is the first job requirement in this advert, and refers to a soft skill, that will most likely be judged depending on past experience. However, if you are able to demonstrate good writing skills (e.g. author/editor of a publication), this may be an acceptable substitute. “Good organisational awareness…” is the second stated job requirement, and this is again a soft skill that is dependent on experience within an organization. “…understanding how to get a range of information and who to keep informed” implies that this experience should be in a larger organization, and that you are able to work independently and effectively in this environment. You’ll have experience in dealing with funding contracts from a range of institutional donors such as DFID, ECHO and UN agencies such as UNHCR and UNICEF as well as donor representation experience. You’ll have experience of carrying out training so that you can build up the project team’s capacity around donors and contract management. You’ll have good administrative and systems skills and be highly computer literate. Attention to detail as well as numeracy, budgeting and financial reporting skills, and the ability to work with others in a team are all essential. You’ll have excellent written and spoken English and ideally good French. 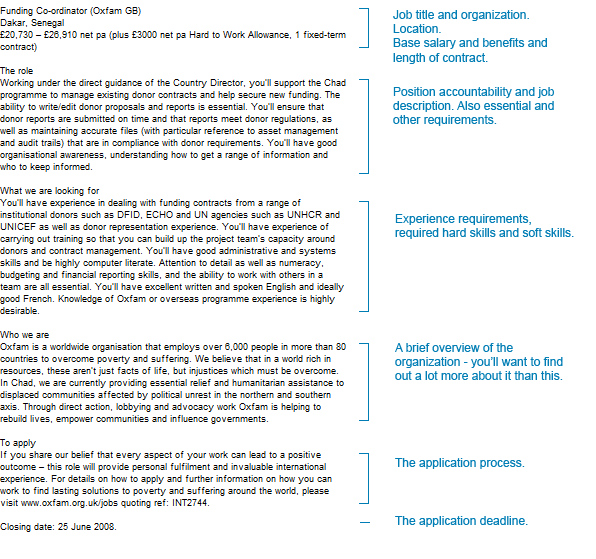 Knowledge of Oxfam or overseas programme experience is highly desirable. This is obviously a very important section of the job advert, as it details how they are screening candidates. The position calls for direct experience with raising funds from major donors, and also “donor representation experience”, which means experience interacting with donors on behalf of another organization. These two requirements will be the hardest to achieve for newcomers to development, but this sort of experience could easily be come by through a voluntary position. Training experience is required, which is a soft skill that can easily be attained through previous work, hobbies, and leisure activities. Obviously, the closer your training experience is to capacity building, the stronger your application. “Administrative and systems skills… computer literate” are soft skills that are highlighted as important, and are readily achievable from past work or from experience in a group or team. Cited as essential “…attention to detail…” and “…ability to work with others in a team…” are also soft skills that can easily be developed in previous work or any situation where you have been involved in a group (e.g. sports team, organising events etc.). Slightly more demanding to achieve are “numeracy, budgeting and financial reporting skills”, also deemed to be essential. If you have any experience reporting how funds have been spent (e.g. to donors of a sports event you have organized), this will have provided you with relevant skills. The next sentence deals with language requirements: “You’ll have excellent written and spoken English and ideally good French”. These are the only hard skills mentioned in this whole job description, and even then, the qualifier “ideally good” does not rule out candidates with no French ability at all. Again there is a qualifying phrase “highly desirable”, indicating the importance of “knowledge of Oxfam or overseas programme experience”. There is no excuse for not finding out about Oxfam, as this is readily available on the internet, but the applicant should also be finding out about Oxfam GB. Overseas programme experience is obviously something that will help your application, but it has not been prioritized in these job requirements, allowing those without any experience to apply. Oxfam is a worldwide organisation that employs over 6,000 people in more than 80 countries to overcome poverty and suffering. We believe that in a world rich in resources, these aren’t just facts of life, but injustices which must be overcome. In Chad, we are currently providing essential relief and humanitarian assistance to displaced communities affected by political unrest in the northern and southern axis. Through direct action, lobbying and advocacy work Oxfam is helping to rebuild lives, empower communities and influence governments. A quick description of Oxfam, which is certainly not enough background knowledge for an applicant – remember, they have stated that “knowledge of Oxfam” is highly desirable. If you share our belief that every aspect of your work can lead to a positive outcome – this role will provide personal fulfilment and invaluable international experience. For details on how to apply and further information on how you can work to find lasting solutions to poverty and suffering around the world, please visit www.oxfam.org.uk/jobs quoting ref: INT2744. Make sure you pay attention to the stated procedure. It is vital to get this right, otherwise the time spent on a well-crafted application could be utterly wasted. In this case, the procedure is detailed on the recruiting organization’s website. You should make a habit of always searching for and visiting the website of any organization you are applying to, as there may be additional information regarding the job and job requirements. Closing date: 25 June 2008. Does this mean the end of 25 of June 2008 in the UK? Probably, but make sure you give yourself a buffer of 24 hours to be sure. If you’re running out of time, and you’re still not satisfied your application is perfect, it still may be better to send it in, rather than run the risk of overshooting the deadline. If you really need more time, consider emailing them to explain why you can’t make the deadline – but the reason had better be really convincing. Interestingly, this job requires very few hard skills, which highlights the importance of developing your soft skills. Neither does it require a certain number of years experience in development, which is a common stipulation. Therefore, this type of job provides a very good opportunity to break into international development.